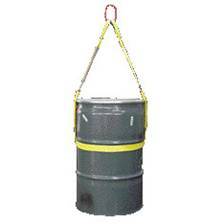 Nylon Drum Handling Slings are designed for the efficient handling of 55 gallon, metal drums with ribs. Drum Slings can be used on open drums or drums fitted with spigots or pumps. 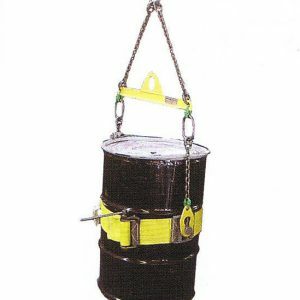 Drum Handling Slings feature a 2-inch lift bridle and circumferential tightening band. The lift bridle features a Masterlink (1/2 In. Dia.) and is permanently attached to the tightening band, eliminating the need to position the bridle legs. The tightening band securely grips the drum below the first rib. 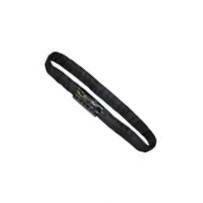 The circumferential tightening band is leather lined. Bridle legs feature sleeves for sling protection. 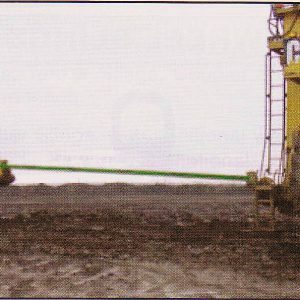 DS1-602 ADJ, Adjustable Drum Slings handle drums of varying diameters. The DS1-602 ADJ has the same constructional features as the standard DS1-602 model, except only one bridle leg is attached to the circumferential tightening band. The unattached bridle leg must be positioned directly across from the attached leg. 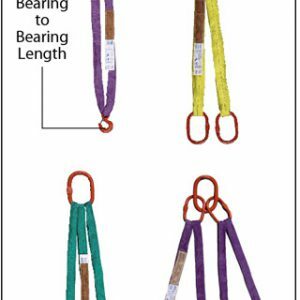 The leather wear pad attached to the tightening band for standard models is omitted on adjustable models to allow the band to pass through the ratchet buckle for smaller drum diameters. The Manual Drum Turner Sling (MDT) is a material handling solution for handling and dumping drums, where precise control is not needed.